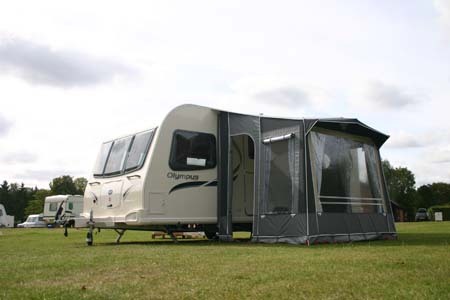 Modern caravans are designed to be used all year round. So to get the most out of your investment means using it even in bad weather. It also means that a bit of pre-planning will help ensure you get the maximum amount of enjoyment from it. You’ll need propane – red cylinder – LPG because butane will not ‘gas’ below 1oC whereas propane will do so down to -40oC. You will also need a propane regulator available from caravan dealers. And to make sure you don’t run out of gas we recommend taking two cylinders – say a 6kg and a 3.9kg. Warning: Never use the oven and/or grill to help warm the caravan because carbon monoxide – which is a by-product of combustion – is a killer. 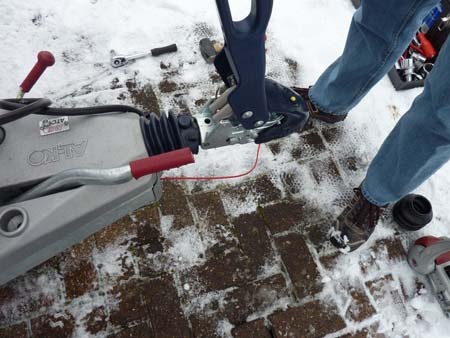 If you intend staying on a site offering electric hook-ups you could supplement your caravan’s gas heating system with a portable 2Kw heater although the amount of electricity can vary according to the number of caravans connected to the bollard. 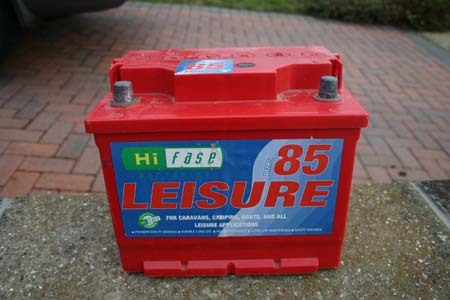 Make sure the caravan’s leisure battery is fully charged before setting off. And if you intend staying for more than a few days a second battery is worth considering as so many of the caravan’s appliances rely on 12V in order to work properly. An inboard water tank is the ideal water container in bad/freezing weather conditions. But if an Aquaroll or other external water container is used it will need insulating to prevent the water from freezing. For the best results use a purpose-designed jacket but avoid jackets which require the full container having to be lifted into the jacket. Instead buy a wrap-around jacket. Some salt added to the waste water container after emptying will help prevent freezing. If the caravan doesn’t have captive pads fitted to the steadies you can make your own from four pieces of 12mm thick wood 15cm x 15cm square. Placed under the steadies they will prevent them sinking into the ground. It’s also a good idea to make a fifth pad to go under the jockey wheel to prevent it from sinking when you’re levelling the caravan. 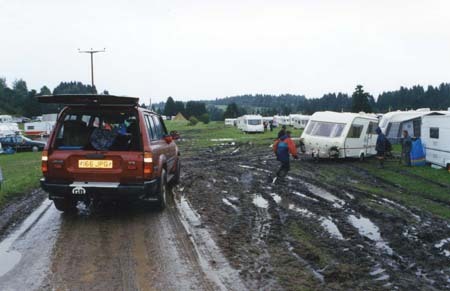 Place blocks in front or behind the wheels as appropriate, to prevent the caravan from moving when pitched on a slope. 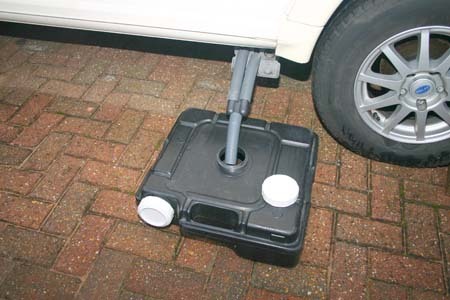 Similarly, because the caravan handbrake should be left in the off position to prevent the brakes from freezing onto the drums in sub-zero temperatures, use blocks to choc the wheels. A pair of track mats – available from any good caravan accessory shop – can be used to help the towcar get off a boggy pitch. However, if the towcar is unable to pull the caravan off the pitch, unhitch the caravan and drive the towcar forward onto firmer ground. Then use a tow rope to pull the caravan off the pitch. But remember that tow ropes available from high street car accessory shops are intended to be used with rolling loads – not bogged down caravans so make sure everyone stands well clear in case the rope breaks. And never let anyone push the caravan as it will only apply its brakes as it moves towards the towcar. Regardless of weather forecasts, expect poor weather so make sure you have adequate suitable clothing with you. Similarly, suitable bedding will ensure you don’t get cold in bed so replace the summer duvet with a winter one – or take extra blankets. A porch awning is ideal for bad weather caravanning as it gives you somewhere to hang your wet gear rather than having it in the caravan. It also helps prevent heat escaping because the caravan door is inside it. An awning carpet will also help prevent mud etc from being taken into the caravan. Snow build up on the roof of the caravan isn’t usually a problem in the UK but on an awning it can be, so make sure to brush it off before it causes the awning to collapse. Similarly, ensure the awning roof is set at an angle which allows rain to run off. Make sure to keep the caravan’s air vents clear of snow build up in blizzard conditions and never block them to reduce draughts. Before leaving for home don’t forget to drain down the hot water tank and the inboard tank to prevent the water in them from freezing. And leave all taps slightly open so that if the residual water in the pipes freezes the air can escape as the ice expands. Do you have any hints on maintaining caravans throughout the winter? Share your tips in the comment box below! Bad weather can strike at any time, that’s why provide cover for when your caravan is out on the the road and also when it’s stored away. We also cover storm, flood and accidental damage which means that you’re insured whatever the weather. Find out more about our tourer caravan insurance policy. Before you turn in fill your kettle or pan with water incase your water is frozen overnight so you can have a warm cuppa during the night or early next morning to start the day.If it’s forecast windy during your stay find the direction and have your entrance to the caravan opposit to the wind so it’s easy to open and close the door. Great tip to leave some water in the kettle John, we couldn’t get going without a cuppa in the morning! Set your ‘fridge vents to winter setting or fit the manufacturer’s approved winter grills to keep it running efficiently. When pitching up consider a pitch facing into the prevailing wind so you can use roof vents to remove condensation without rain or snow being driven in. Take an extra dog to put on the bed in case it gets really cold! Great tips Andy Wilson. Thank you for the comment. Thanks for getting in touch. Yes, you should always disconnect the hose if the temperature is low or freezing to stop the water in it from freezing. I hope this helps. Dome brilliant tips there, thank you. Wondering if we could ask for a few more? We are going away tomorrow for half term….. In this predicted hurricane! We are gonna make sure we have gas and the battery is charged in case the on site EHU fails but can anyone give any tips on dealing with the driving rains and 80+ mph winds that are expected? There’s a part of me that wants not to go and the other part that says no, sod it! I will not let the Weather spoil it! Two great tips, thanks Andy! Keep them coming everyone! Carry spare fuses, if one blows in your heating system and it’s freezing outside, it won’t be long before you are shivering. Also keep a small handy toolkit containing essentials under a bunk, at least the tools won’t be cold and damp and dirty in your van. If driving in snow and ice either to or from a site, ensure tyres and weights are adhered to and keep the tow car in as high a gear as possible so as not to induce rear wheel spin which will jackknife your outfit. Glad you find these useful Phil! When the temperature gets really low, unplug the water pump and bring it into the caravan overnight. If you are on hookup, a pond heater dangled into the aquaroll will stop it from freezing over. Dont forget to take a Carbon monoxide alarm with you, its easy to accidentally block vents. Always place your aquaroll on a piece of wood as well as insulating. Fit an auto changeover valve for gas as it always runs out in the middle of night.